Stroll through the brownstone and tree-lined Greenwich Village and experience sidewalk dining and all its charm. 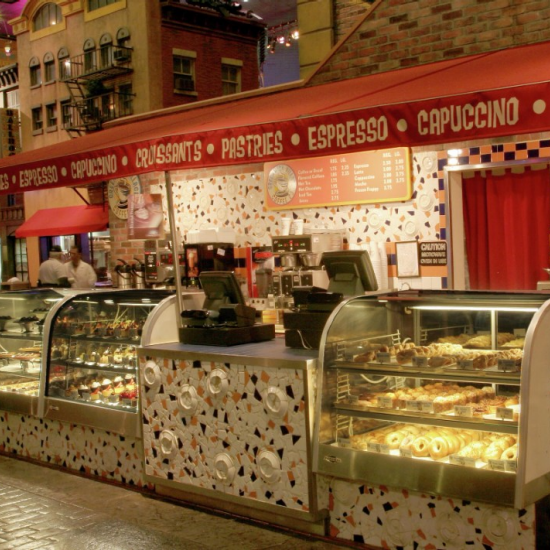 The Village Eateries offer Sirrico’s New York pizza, famous neighborhood sandwiches at Greenberg's Deli, fish, chips, and more at Fulton’s Fish Frye, fresh baked pastries at the Village Bakery and the best hot dogs on the strip at Times Square to Go. Located on the lower level by the North Door entrance and the Zumanity theater. 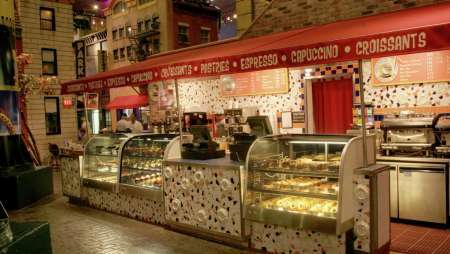 Inside the Village Street Eateries, you will find a variety of quick bites such as authentic New York sandwiches, Kosher hot dogs, fresh fried fish, New York style pizza and desserts. Take the parking garage hallway to the escalator towards the Casino. Head right towards the Front Desk and take a left. Take the carpeted walkway directly in front of the front desk and continue straight passing Il Fornaio on your left, and then head left at the end of Il Fornaio's patio. Continue straight ahead and you will find Village Street Eateries. Take the parking garage hallway towards the Big Apple Coaster and Arcade. Pass Nathans on your left and take the escalator on the right down to the Casino Level. Once in the Casino go left towards Il Fornaio. Pass Il Fornaio on your left and then head left at the end of Il Fornaio's patio, and you will find Village Street Eateries. If you are facing the Front Desk, go right towards the Century Elevators. Continue heading straight, passing Il Fornaio on your left and then head left at the end of Il Fornaio's patio, and you will find Village Street Eateries.